For all your carrier bags needs. Plastic carrier bags are widely used everyday by supermarkets, fruit shops and retailers amongst many others. There are many types of plastic carriers today but maybe the most commonly used is the vest type style which we see all the time in food shops, they normally have a printed logo used as a budget marketing way for that store since these bags can be re-used, making them sort of eco-friendly, as long as we remember to re-use them, the store name will be seen again and again. Although plastic vest-type carriers are the ones mostly used there are other types made from polypropylene, paper or card to suit different requirements. The most common and cheapest types of carrier bags often used in corner shops, newsagents or smaller retail outlets. The vest-type carrier bag is made of High Density Polythene, usually of very low gauge, giving good strength for a bag that is often not totally filled. Like all bags, this type of carrier can be customised with a logo by businesses but the strength of the range is really large variety of pre-coloured bags available giving reasonable branding for a low price. Carrier featuring an extra patch glued inside the handle to make it more resistant and stronger for use in retail stores with heavier or higher value items. Carrier bag varying in gauge from the top to bottom, hence its name Varigauge. The handle area has a gauge twice as thick as that at the bottom allowing for a strong handle without the need for reinforcement. This gives a good balance between strength and manufacturing cost. A flexiloop carrier is similar to the Varigauge carriers and patch handled carrier bags, but these have a welded polythene loop handle attached to make the bag seem more distinctive. These types of Carrier bags are manufactured using consistent gauge and are side vented (otherwise known as 'gusseted') and with two plastic handles which clip together to close the bag. Carrier bags with a rope attached to the base for carrying as well as letting you pull it to close the top. Also known as Drawstring bags for obvious reasons. Commonly found in supermarkets (or the butchers, hence their alternative name) and primarily used for dispensing food. Usually small and white but quite strong sold in big easily dispensing packs and normally made to satisfy the stringent health and safety standards required for food bags. Discount Carrier Bags is the best place to source carrier bags at manufacturers prices. Find quality suppliers of discounted polythene bags, plastic carrier bags and shopping bags. Provides a buyers guide with information on the different types of carrier bags and printed carriers available. For all your needs for plastic carrier bags and polythene bags visit Carrier Bags – a website specialised in carrier bags with information on all types, and colours available. Buy from selected UK wholesale suppliers and save money. If you are looking to purchase quality carriers bags at low costs Carrier Bags.co is the place to go. With hundreds of options on polythene carrier bags all provided straight from the manufacturer. Great website for all retailers and shop owners, with a wide range of vest type carriers to choose. All direct from manufacturers. Another great website for shop owners. Retail Bags offer a great selection of high quality retail bags and plastic carriers to suit most needs. Buy bulk and save money, free UK delivery. Coloured Bags is a website dedicated to find wholesale suppliers and manufacturers of high quality coloured bags and printed carriers. Couloured Bags Direct aims to help you finding manufacturers and suppliers of coloured carrier bags. Select from top UK suppliers of printed bags all with free UK delivery. PackagingKnowledge article with details and specifications on all types of carrier bags. To make your carrier bags for your business or organisation really stand out from the crowd, why not print your own bespoke design on them using a bespoke printed carrier service. This will not only reinforce your brand but it will turn your customers in to walking adverts for your products and company! Offers you complete suppliers of discounted plastic carrier bags. If you are looking for basic vest style carrier bags or exotic printed carrier bags, you will find all you need. Discount Printed Carrier bags specialises in printed carrier bags but also offers off the shelf carry bags in all sizes and colours. Buy all your carriers from wholesalers at discounted prices that don't compromise the quality. 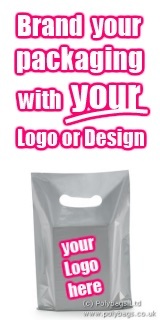 If you need to print your logo on carrier bags Printed Carrier Bags 2u is the ideal place to go. Choose from many colours and carrier styles to help you company stand out. Order printed carrier bags direct from manufacturers at low costs, cut the middle man and save money. Get all you carrier printed with your logo or design direct from suppliers. If you prefer you can also choose from off the shelf carrier bags. If you are a retailer looking to market your company or store you should consider visiting Printed Bags Direct. Order you printed carriers straight from wholesale suppliers and manufacturers at discounted prices and get you company promoted for a very low price. Printed Bags is a website specialised in printed bags with discounted suppliers and manufacturers of plastic carrier bags. Choose from pre-printed options or have your designed the way you want. Printing your logo or a message on your carrier bags is one way to make a statement to your customers but an equally powerful comment is to make your carriers environmentally friendly so that your customers know you have a green, sustainable and eco-friendly approach to business. If you wish to consider a more green option take a look at our biodegradable carrier bags section. This gives an excellent range of websites that focus on green eco-friendly packaging for business purposes as well as discussing the different types of biodegradable carrier bags, degradable carrier bags and recycled carrier bags that are now available.